I have gotten into the habit of buying broccoli in large quantities, as it has been abundant and inexpensive at my neighborhood Treasure Island. I usually prep and blanch it as soon as I get it home so it is handy to grab a handful for snacking, or to throw some into a dish. Because I never know exactly how I am going to use it, I usually cook it for a scant 3 to 4 minutes, so it is cooked just enough to eat out of hand but is still crisp enough to withstand being cooked more if I'm adding it to something on the stove or in the oven. Every once in while, however, something comes up and I leave it on the stove for a little longer than I had planned and it overcooks. That is what happened here, with some beautiful florets for which I had big plans. But I got called away from the kitchen and by the time I got back and drained them, I basically had a bowl full of mush on my hands. What to do? Why not puree them all the way and make Cream of Broccoli soup? It took just a few minutes and I must say that it tasted much much better than it should have! I did not have cream so I added half a cup of coconut milk instead, and that gave it a well-rounded, full-bodied taste and texture. Toasted walnuts were the perfect garnish - their woodsy flavor was the perfect complement to the almost grass-like flavor of the broccoli. A dribble of walnut oil was the perfect finish. The next time I make this, it won't be because I accidentally overcooked my broccoli. I will have done it on purpose. This would make a lovely starter for a holiday or company meal, but it is also substantial enough to make a meal in itself with a nice hunk of crusty bread. Heat the oil in a large pan over medium heat. Add the shallot (or onion) and cook until it has softened, about 5 minutes. Do not brown. Add the blanched broccoli florets and cook for another 5 minutes or so, until they have heated through. Add the vegetable broth and bring to a boil. Lower the heat, cover, and simmer for 10 to 15 minutes, until the broccoli and onions are tender. 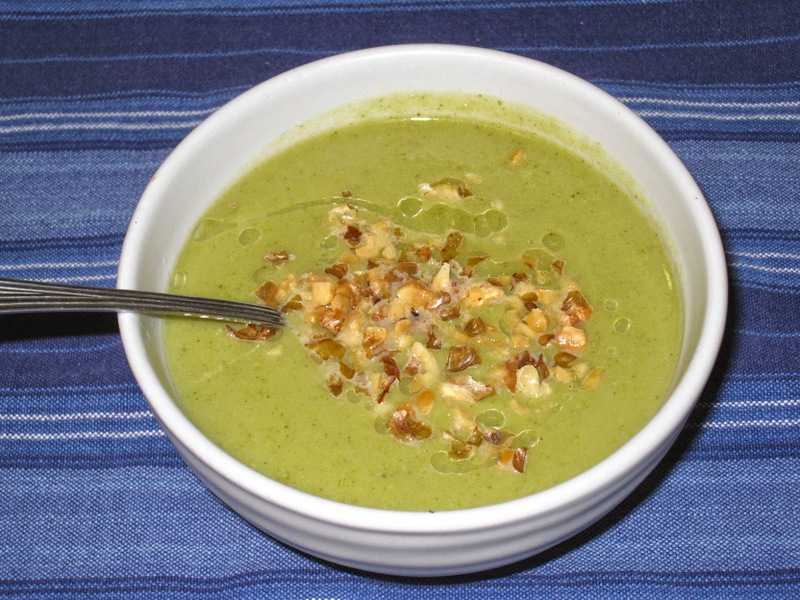 Puree the broccoli and shallots (either with a stick blender, a blender, or a food processor) until very smooth. Add the coconut milk and season to taste with the salt and pepper. Add water if necessary to reach the desired consistency. Serve hot, garnished with chopped toasted walnuts and a sprinkle of walnut oil.